I have a few more cards to share with you featuring some of the newly released items. If you didn't get a chance to shop last night you can find all the newly released items HERE. If you haven't guessed it already, Desert Bouquet is one of my favourite new stamp sets! I have used it on so many different cards. For this first card I stamped the flowers in Peach Bellini and Persimmon Premium Dye Ink. The leaves were stamped in Limelight Premium Dye Ink. I used the Stitched Rounded Rectangle STAX Die-namics to cut the main panel. The sentiments are from the Friends like Us stamp set. My next card features the same stamps but in a completely different color palette. Here I used Wild Wisteria, Blueberry, Lemon Drop, and Limelight Premium Dye Ink. I used the new Friend Die-namics to cut out the friend window on the front of the card. I kept the inside of the card clean and simple as I didn't want anything to show thru the window on the front of the card. 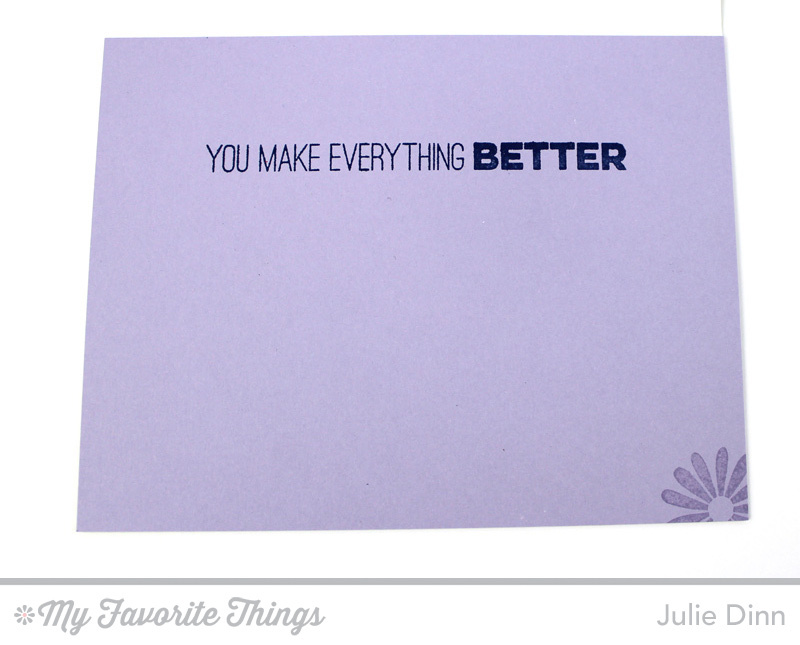 I used Wild Wisteria card stock and I stamped the sentiment in Blueberry Premium Dye Ink. Thanks so much for joining me this past week. I hope you have enjoyed all the projects I have shared. Don't forget to check out the MFT Blog to see all the fabulous creations the Design Team created to share with you. sweet card! beautiful colors and layout of the front. Loving the desert bouquet stamp set. I love these, Julie! These colors together are just beautiful! DECEMBER release was fabulous! I love these cards! The colors, the styles and the Desert Bouquet are great! Great cards! The color combos are sweet, really like the Peach Bellini and Persimmon together! Very pretty cards. A relief from the bright Christmas colors. The sentiments are so fun. This is so cute and love the random stamping and colors combination is adorable! Oooh, I love these colors on your wonderful cards. Great cards, the colors are gorgeous. Thanks for sharing your work with us. Love how you used the stamps to make your backgrounds! !